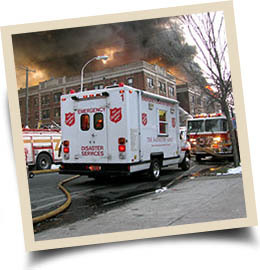 The Salvation Army’s Emergency Disaster Services are composed of volunteers who help those of are affected by events beyond control. Fires, floods, severe weather and other disasters happen in our community, and our team makes the effort to support everyone involved–victims, survivors, and first responders. We are seeking volunteers to assist us in the field. We welcome all skills and backgrounds and provide training to all volunteers. The opportunities offered The Salvation Army’s Emergency Disaster Services gives you the opportunity to provide assistance to the people most affected by an emergency. Most of all, through volunteering with EDS, you will gain useful knowledge of emergency situations.